Pixe, the Maryland-based technology company and developers of leading mobile social marketing solutions, powered the official photo booth for the Notre Dame Reunion 2014, significantly extending the University Alumni Association’s reach on leading social media. 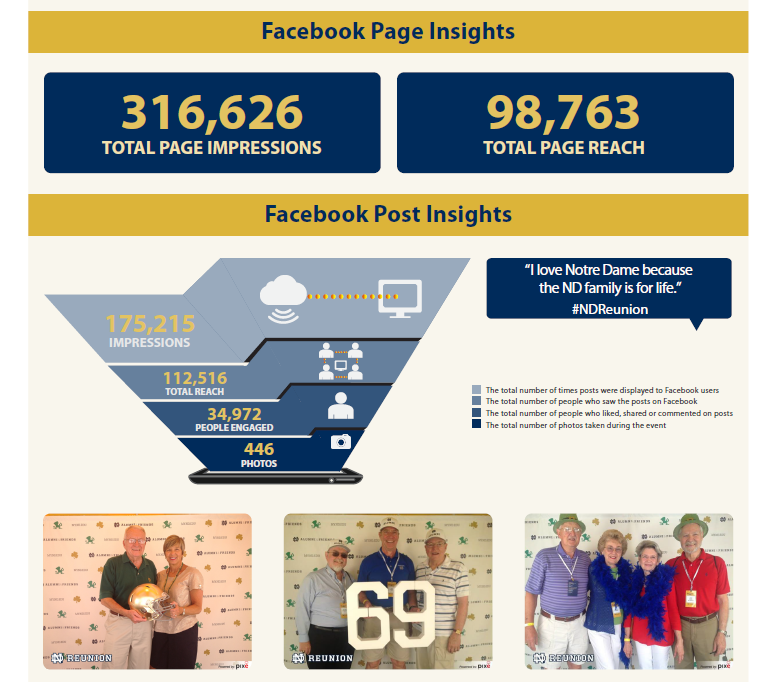 The 446 photos shared during the Alumni Weekend from the Notre Dame Reunion Pixe Social Photo Booth were viewed by 112,516 people 175,215 times on Facebook between the period of May 29 – June 4, 2014. In addition, 34,972 unique people liked, shared, and commented on the photos, extending the event’s reach to over 98,000 fans. Pixe provided interactive tablet-based photo booths for alumni, posting photos to the Notre Dame Alumni Association Facebook Page and tweeting in real-time with the event hashtag #NDReunion. “Pixe’s revolutionary solution leverages user-generated content while also keeping fans engaged with the brand through subsequent marketing promotions, delivering significantly enhanced online engagement and more leads within a very short period of time," said Rajiv Jain, CEO of Pixe LLC. The enthusiastic Notre Dame Reunion audience was given the opportunity to click group photos with friends, family, and former classmates in front of a customized ND Reunion branded backdrop featuring the University’s mascot, the Fighting Irish Leprechaun. The photo booth users posed with fun props such as large numerical cutouts representing graduation years. The photos generated considerable engagement among onsite and online fans during and after the weekend of activities, as is evident from the infographic posted below. Following up with such impressive results at this first event with Pixe, the Notre Dame Alumni Association will continue to partner with Pixe at their upcoming events through the year. The University of Notre Dame is a Catholic academic community of higher learning, animated from its origins by the Congregation of Holy Cross. Located in South Bend, Indiana, the University prides itself on being an environment of teaching and learning that fosters the development in its students of those disciplined habits of mind, body, and spirit that characterize educated, skilled, and free human beings.